You have been warned. If you don’t want to be upset don’t read any further. These are my thoughts – and if you don’t agree with me you won’t be seeing it from my point of view! Now, how could I refuse? I had no intention of refusing, but Beavers was not around when his father was the same age so the placement of badges was a little uncertain. Also, the ‘costume’ (I use the right word here, they don’t wear ‘uniform’ in my humble opinion) (that’s the first ‘upset’ out of the way) is different, so where to sew them? Aha! The website! Of course, it will be easy! By chance I then came across a ‘helpful’ forum where frustrated mothers (and probably grandparents) ask for help about such things as badge placement. What a lot of twaddle! The answers were written by apparently grown up men (there may well have been associated women but I gave up very quickly) with advice like ‘don’t forget to tack’ (the only tacking they have probably ever done is in boats, no doubt) and ‘Glue! How dare you glue!’. The one I liked best was the one that said ‘make sure you don’t sew it on wonky’. Wonky? If a grown man has time to sew his own badges on straight it is a sure sign to me that he hasn’t got enough going on in his life. Suddenly all the distress and frustration caused all those years ago by ‘Leaders’ of Scout troups, Cubs and Scouts, came flooding back. I was so relieved when dear son finally left, and now it’s all starting over again. Anyway, enough of that…..
Will I sew on the badges? Well, yes, of course I will, however……. At the moment my work table is still covered with bits from our Creative weekend. Undaunted, though I found the thread, and reached for a needle. As I did so I knocked over a tin of pins. It fell to the floor, removing the lid as it did so! Half an hour later I think I had found them all….. so, back for the needles. As the tin had fallen, though, it had dislodged a pincushion which had fallen into the above papers. 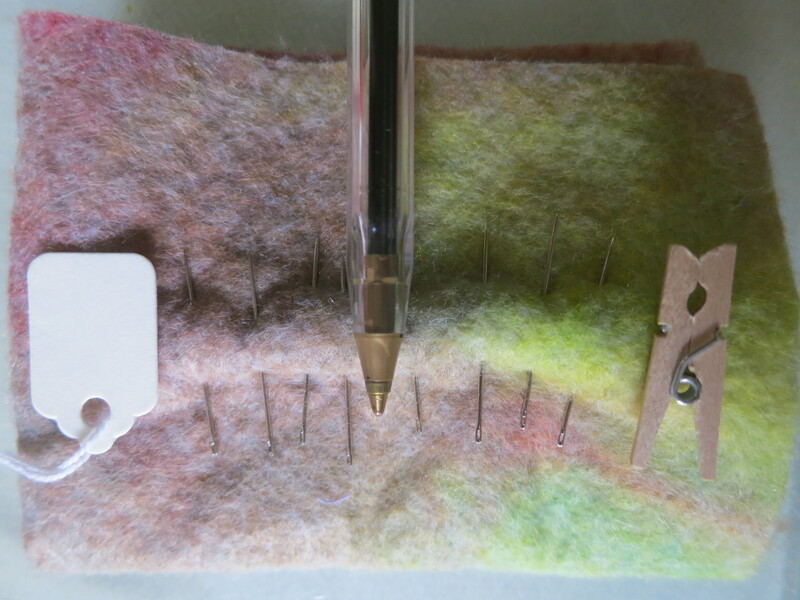 That would have been fine, but attached to it was a pack of ‘betweens’ These, to the uninitiated, are tiny, fine needles for fast sewing. Some of them were now buried within the paper scraps. Another half an hour went by while they were retrieved – not something to come across by accident. Then the phone rang. So, hopping between phone and workstation – flapping arms to stop dear DH from moving bits around – i then had to return to the task of finding them. What a chore! Thankfully, all found! The above picture doesn’t really give a hint of scale as the peg is a tiny craft one. 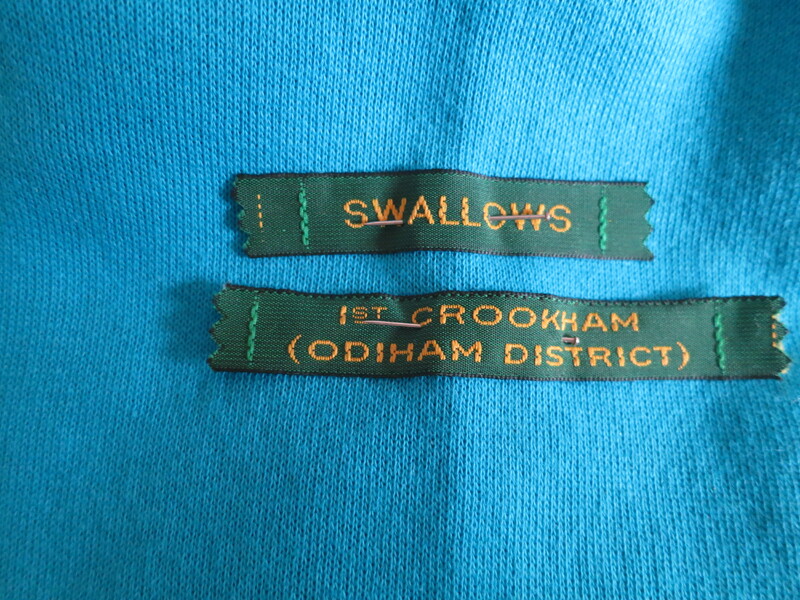 However I still have to sew on those labels – so that’s what I’m about to do now! Tacked? Well, what do you think? I think it looks great. 😀 I’ve dropped some pins before, and when that happens, it can be pretty stressful, even if I only dropped one. So, I can only imagine what it would be like to drop a whole bunch of them. And, if you don’t mind me asking, why do you think this might upset someone? I was just thinking! What if you used some vlisoflix orMisty Fuse and aplliqued badges with iron? ?Not a stitch (tacked or otherwise) in sight. I’ve stitched it Maureen. I always intended to stitch them, but they are so pernickety about placement I needed to know where. Grandson has been briefed – if it’s in the wrong place I’ll redo them next month. He asked if I would show him how to sew a card for mother’s day – bless him! Will I? Ha! You bet! I can imagine. However, you can’t expect a 6 year old to be able to sew perfectly, can you. And the Scout movement don’t just irritate me over the sewing….. but maybe that’s a story for another day. I think they just like rules, and want to show who is boss. I daren’t write what I really think of the current movement, and to be honest, I’m sad that my grandson is part of it. Hopefully it won’t last.